The Battle of Chaldiran. An Ottoman army of ca 60-212,000 janissary, under the Ottoman Sultan Selim I, defeated a Persian Safavid army of ca 12-40,000 men under Ismail Abul-Mozaffar bin Sheikh Haydar bin Sheikh Junayd Safawi, the Shah of Iran. The Ottomans won and temporarily occupied the Safavid capital of Tabriz but could not completely destroy the Safavid state. The Ottomans and Safavids continued to fight intermittingly for the next two centuries. Under Selim I ‘the Grim’ (1512-20), major expansion was resumed. The greatest challenges and opportunities lay not in Europe but in Asia. In 1510, the Safavid ruler Isma’il had defeated the Uzbeks in batde near Marv. The skull of the Uzbek ruler Muhammad Shaybni had been set in gold, made into a drinking cup and sent to Isma’il’s other major enemy, Selim’s predecessor Bayezid II (1481-151 2). Support for the Safavids among the peoples of eastern Anatolia threatened Ottoman security, particularly when it prompted rebellions in the area in 1511-12. Selim brutally repressed the rebels, and in 1514 invaded Persia. 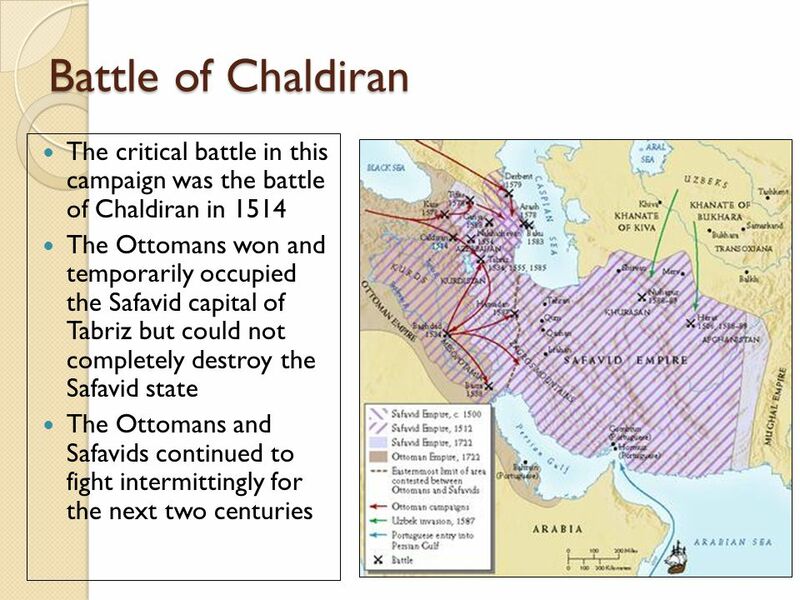 The initial Safavid scorched earth strategy created major logistical problems for the Ottoman forces, but Isma’il chose to fight his far more numerous opponents at Chaldiran on 23 August. The Safavid army was of the traditional central Asian nomadic type: cavalry archers combining mobility with firepower. The Ottomans, however, had made the transition to a more mixed force and had innovative weapons systems. In addition to cavalry, they had infantry equipped with hand guns, and field artillery. The Janissaries of the Ottoman Empire, fighting for Selim I, smashed the army of the Safavids of Iran in this first major battle between the two Muslim empires. The wholly lopsided outcome resulted from the more modern gunpowder weapons and advanced infantry tactics of the Janissaries, but also because the Iranian army was almost exclusively cavalry archers recruited from tribal levies and lacked modern firepower. The Ottomans deployed serried ranks of Janissary musketeers behind wagon-forts. They had also hauled as many as 200 heavy cannon to the battle. The musketeers and cannon exacted a great toll of Iranian horse archers, many thousands of whom fell. Most military historians agree that Ottoman artillery was decisive in the battle, though the Janissary infantry also played a key role in stopping Iran’s cavalry which had scattered the Ottoman timariot cavalry, before falling in droves before the guns. There is some evidence that the Iranians had access to artillery but foreswore it as unmanly and unworthy of holy war. Chaldiran did much to disabuse them of that prejudice while resetting the frontier between the Ottoman and Safavid empires and securing Azerbaijan and Kurdistan to the Ottoman Empire. After Chaldiran the Safavids removed their capital from vulnerable Tabris to more distant Qazwin. Although the Safavids had used cannon in siege warfare, they had none at Chaldiran. The Ottomans won a crushing victory due undoubtedly to their numerical superiority and firepower. But it has also been suggested that it was the cannon that played the crucial role for, chained together, they formed a barrier to cavalry charges. Chaldiran was followed by the capture of the Persian capital, Tabriz (1514), and by a major eastward shift in the Ottoman frontier. As the backbone of Shah Ismail’s cavalry, the Turkmen Qizilbash were central to Ismail’s early armies. They were organized in units or bands in accordance to their tribe. By the battle of Chaldiran in 1514, they are reported as wearing the best steel armor and mail from Shiraz and powerful shields, with their horses also armored (known as Badgostvan). Their weapons included the mace, Shamshir curved sword, dagger, lance, and archery equipment. Their helmets were especially robust, designed to provide as much protection possible in close-quarter combat. The Qizilbash also wore the ceremonial 12-gore hats symbolizing the 12 Shiite imams. Their strong loyalty to Ismail and their belief in his invincibility made the Qizilbash especially loyal and steadfast warriors. Ismail was soon joined by Persian, Azarbaijani, Kurdish, and Talysh warriors, especially in the wake of his victories over the Aq Qoyunlu in Iran. Firearms are thought to have first been introduced to Iran by the Venetians during the Aq Qoyunlu period, specifically at the time of Uzun Hassan (r. 1453-78), as part of an overall strategy of cultivating European relations with the Aq Qoyunlu. Shah Ismail’s father Heidar had deployed cannon in his siege of Golestan in 1488. Shah Ismail used artillery in a number of his early campaigns and, on at least one occasion in 1504, muskets. Despite this, the Iranians failed to utilize firearms at the battle of Chaldiran in 1514. Iran’s upcoming contest with the Ottoman Empire was not unlike the wars fought between ParthoSassanian Persia and the Romano-Byzantine Empire. The only difference was that the resurgent Iranian empire under the Safavids would be facing the Ottoman Turks all along its western, northwest, and Caucasian frontier. As Sultan Selim marched to war, he was increasingly worried that the Iranian shah would not consent to a set-piece battle. This would then force the Ottoman army to march further east. Such a scenario could prolong the campaign, leading to the unwelcome prospect of having to campaign in eastern Anatolia and northwest Iran during the bitter winter months. Selim’s worries appeared to be well-founded. As the Ottoman army marched towards the east, the Safavid governor of Diyarbakr simply evacuated the city. The inhabitants of Diyarbakr then declared their allegiance to Selim who annexed the city on his way towards Azarbaijan. Mohammad Ustajlu Khan, one of Ismail’s most trusted commanders, arrived in Tabriz with alarming news. Ustajlu reported that Selim was now at Erzerum and rapidly moving towards Iran with a huge army. Selim had assembled a massive army variously estimated at between 100,000 and 140,000 men. These included 12,000 Janissaries with firearms, 100 archers and Sepahi (royal cavalry guards). Supporting this giant force were 500 cannon. Selim certainly had auxiliary cavalry, but the actual numbers vary according to the sources. Iranian sources variously report the total number of Ottoman cavalry as ranging between 90,000 and 200,000, which is difficult to ascertain. Undoubtedly the most impressive element in the Ottoman army was the Janissaries. Christian boys recruited from the Balkans, they were subjected to very intense military training, constant battle drills, and education and formed into a war-winning arm of the Ottoman military. Selim’s subsequent victory had also much to do with logistical planning, especially as he had marched his huge Ottoman army all across Anatolia into Azarbaijan for the decisive contest against Ismail. Ismail lost no time sending messages for troops to mobilize throughout Iran’s cities, tribal regions, and provinces. Some reached Tabriz on time for the battle, but many did not; the forces of Deev Sultan of Balkh reached Azarbaijan after the battle had ended. This meant that the total number of available troops for the upcoming battle was alarmingly low. Primary Iranian sources such as the Alam Araye Safavi report 18,000 troops in the Safavid army with the Habib ol Seyr citing a total of 12,000 men. In general, it is estimated that the total number of Iranian troops would have numbered around 30,000-40,000 troops, around the backbone of Qizilbash cavalry. The very large numbers of Ottoman troops, and especially cannon, were a major concern for Ismail. In an emergency military session the Qizilbash chiefs and Shah Ismail unanimously agreed that their only option was to face Selim directly in a set-piece battle. The main problem with this decision was that no solution had been found to neutralize the Ottoman cannon and musketeers. Perhaps Ismail and the Qizilbash chiefs were confident that their cavalry would charge through the Ottoman ranks before Selim’s firepower could assert itself on the battlefield. Ismail and his commanders found a way to turn the size of the Ottoman army against itself. They applied scorched-earth tactics all along the Ottoman advance. This was a highly effective strategy as it left the very large Ottoman army without access to local food or water. Adequate shelter also became a problem as the retreating Safavids destroyed all houses and urban centers along Selim’s advance. The scorched-earth tactics put immense pressure on Selim’s troops. This situation along with concerns over fighting fellow Muslims led to a near-mutiny among the Ottoman ranks. But the news that Shah Ismail was waiting for the Ottomans at Chaldiran quickly put to rest all dissension. One of Ismail’s major errors before Chaldiran was giving up his mountain base at Khoi. That location would have allowed him a much more effective defense as Selim would have been forced to fight in very difficult geography. Instead Ismail chose to march down to the flat plains of Chaldiran between Khoi and Urumiah (approximately 100 miles (160km) northwest of Tabriz), an ideal location for Ottoman artillery and firearms. An even greater mistake was Ismail’s failure to heed the advice of his two top commanders in the field, Mohammad Beg Ustajlu and Noor Ali Khalifa, who had had experience fighting Ottomans. They urged Ismail to attack immediately before the Turks had time to complete the set up of their cannon and troops. Ustajlu also counseled against frontal attacks due to the strength of Ottoman firepower. But Ismail was swayed by the arguments of another highly influential Qizilbash leader, Durmish Khan Shamlu. The latter counseled that Ismail simply wait until the Ottomans had completed all of their preparations because he thought that a pre-emptive attack before the Ottomans were prepared was “unmanly” and cowardly. Whatever Durmish Khan’s motives were, he certainly succeeded in swaying Shah Ismail who then reputedly said “I am not a caravanserai thief. Whatever is decreed by God will occur.” So the Ottomans were given ample time to complete the lining up and chaining together of their cannon carriages. The chains would bar Iranian cavalry from dashing through the spaces between the cannon. Mortars were also placed atop each of the cannon carriages. 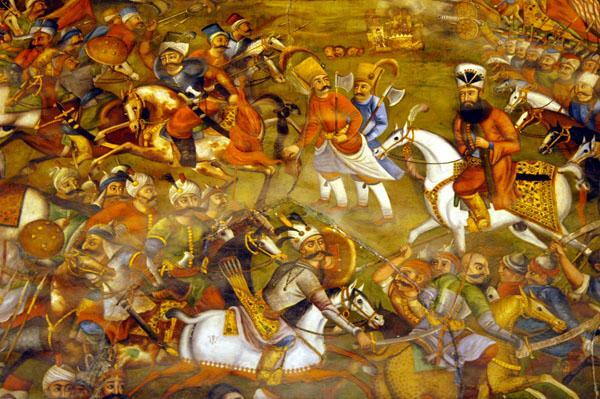 The Ottomans then positioned their 12,000 musket-armed Janissaries behind their cannon. By heeding the advice of Durmish Khan, Ismail had squandered his one chance of minimizing the impact of Ottoman firearms against his forces. Ismail’s unfathomable blunder was also perhaps derived from his charismatic overconfidence; he believed himself to be divinely invincible. Having positioned his forces, Selim selected a hill from which he could observe and direct his forces during the battle. His headquarters were protected by his best men and cannon. Ismail took his position among his troops in the center of the Iranian army, which had no firearm units or cannon. The battle began in the early morning of August 23. The Ottoman cannon immediately opened fire with their large barrels, causing much panic among both Iranian and Ottoman horses. From the outset the fighting was fierce and bitter. Had Ismail attacked when the Ottomans were still organizing, he might well have broken the Ottoman lines. The Alam Araye Abbasi provides a glimpse into the chaos and savagery of the fighting, reporting that when Selim dispatched one of his champions to challenge Ismail in heat of battle, Ismail rode towards the Ottoman, raised his Shamshir sword and cut off his head. Ismail fought beside his troops, but this time the enemy host was too large and well equipped to be overcome by sheer gallantry. Ismail led the Safavid right flank to attack the Ottoman left flank, killing its commander Hassan Pasha. Despite this terrible blow, the Ottomans did not collapse. Another Ottoman commander, Sinan Pasha, rallied the shaken Ottoman troops, enabling them to stand their ground. Sinan then led a deadly attack with his Balkan or Rumelian troops killing one of Ismail’s top commanders, Ustajlu, whose attacking contingents were scattered. Shah Ismail responded by bravely leading charge after charge towards the Ottoman center only to be repelled each time with heavy casualties. The devastating impact of Ottoman firepower has been noted by Iranian sources. Despite terrible losses, Ismail and his companion Qizilbash cavalry succeeded in reaching the Ottoman front lines a number of times. Using their Shamshir swords, Ismail and the Qizilbash even succeeded in shattering some of the chains linking the Ottoman cannon. But each time they were forced back with heavy losses. Despite this, the Qizilbash attacked once more, forcing many Ottoman troops to fall back to the sanctuary of their cannon and the Janissaries. These actions were certainly brave and impressive, but the Ottoman center remained intact. Sinan then sprang a deadly blow by launching a powerful counterattack from the Ottoman right flank. This attack crashed into Ismail’s flank. The impulse of Sinan’s attack was so strong that Ottoman troops reached Ismail’s camp, capturing plunder and one of his wives. The Iranians now had no choice but to concede defeat. By this stage many of Ismail’s top commanders had been killed and Ottoman firearms had taken a terrible toll on Safavid troops. It was clear that no amount of bravery, élan, or dogged determination could overcome the Ottoman juggernaut. Selim though had not escaped unscathed: he had lost a good number of his Albanian, Serbian, and Greek cavalry to the formidable Qizilbash. Still it was Selim who emerged as the undisputed victor at Chaldiran. Ismail decided to withdraw and yield the field to Selim. He went with a small number of his Qizilbash followers atop a hill and began to sound his Karney Sufi flute to signal the retreat. The extent of the catastrophe became evident when only 300 survivors gathered around him. The next day, Selim executed all captured Iranian troop commanders. Ottoman numerical superiority was definitely a major factor in Ismail’s defeat, but Ottoman superiority in artillery and firearms, which enabled them to decimate the Iranian cavalry, was crucial. Ismail had used firearms and artillery in a number of his earlier battles, but at Chaldiran he used neither. He may have chosen not to use them because the Qizilbash viewed firearms with contempt, seeing these as less “manly” than traditional weapons. As noted by Savory, “The inescapable conclusion . is that the Safavids did not use firearms at Chaldiran because they did not choose to use them.” A further issue cited by Iranian sources was that no new supplies of European firearms had arrived to Iran prior to Chaldiran. The Portuguese admiral Albuquerque had sought the pope’s help to dispatch cannon to Ismail before the battle, but these efforts proved unsuccessful. Selim captured Tabriz a little over two weeks later on September 5, 1514. The logical course of action would have been to pursue and destroy Shah Ismail, but Selim’s generals had other worries. Despite having won the battle at Chaldiran, Selim withdrew from Tabriz just eight days later. Neither he nor his senior commanders wished to spend the bitter winter months in Iran. Ottoman supply lines were overstretched, making them vulnerable to attacks by the local Iranian cavalry in Azarbaijan. The scorched-earth tactics employed in the area ensured that the Ottomans would have no local supplies to sustain them in Azarbaijan. Iranian cavalry could also conduct very costly raids against Ottoman occupation forces; while inside Tabriz the local population was fighting against the Ottoman occupation. These factors combined to dissuade Selim from trying to conquer Iran. As they left Tabriz, the Ottomans did capture Kars to the northwest of Azarbaijan, as well as Nakhchevan, and Yerevan in the Caucasus. Shortly after Selim departed from Tabriz, Ismail re-entered the city against no opposition. Although Tabriz was once again in Safavid hands, Iran had lost much after Selim’s invasion. Much of eastern Anatolia was now detached from Iran. Arzanjan, Diyarbakr, and much of Kurdistan were soon occupied by Istanbul, never to be recovered by the Iranians. These regions were host to a number of Kurdish emirates whose political machinations were similar to the former Aq and Qara Qoyunlu confederations. The Ottomans did little to change the administration of those emirates and even helped strengthen the position of local rulers or “emirs” now under their rule. This entry was posted in Battle, Ottoman by MSW. Bookmark the permalink.